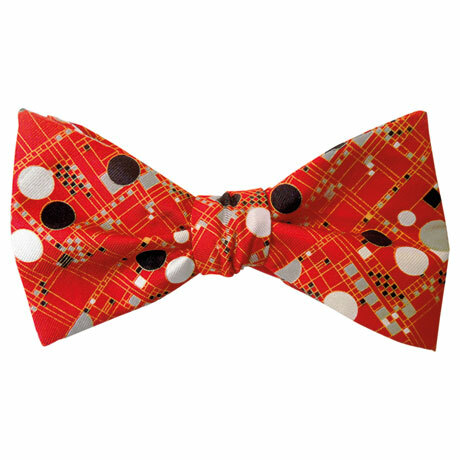 The Frank Lloyd Wright Coonley Playhouse bow tie is a perfect architecture theme gift for an architect or Frank Lloyd Wright aficionado. This self-tie bow tie design is adapted from a window detail of the Frank Lloyd Wright Avery Coonley Playhouse in Riverside, Illinois (1912). Wright was inspired by, and experimented with the simplicity of geometric shapes such as triangles, squares and circles. 100% Silk. Choose Navy or Red.